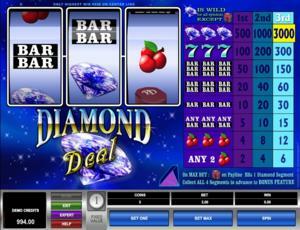 Diamond Deal is a classic online video slot game from Microgaming that has been released in November 1999. This online video slot machine game has 3 reels and 1 pay line. The theme of Diamond Deal is all about diamonds. It has been said that diamonds are a girl’s best friend. Well, in the Diamond Deal online slot game, it is also a boy’s best friend! The Diamond Deal online slot machine game is a classic 3-reel, 1-pay line slot that is suitable for all types of players. So, whether you are a beginner or an experienced player, Diamond Deal is a great game for you if you want to have a go at a classic old-school slots game with a few modern twists – a wild symbol and a scatter symbol that enables you to play a bonus feature game. Most Microgaming online slot games are available in 2 formats. The first format is the one preferred by most players, which is the download format. The second format is the Flash or browser-based version, which means there is no need to download anything at all. Whether you like to download or not, Microgaming has slot games for all your slot gaming needs. Good thing that Diamond Deal is available for instant play, so you do not have to download anything to find out if this game interests you enough in a way that you would like to spend some real money on it. Diamond Deal features 3 reels and 1 pay line, a wild symbol, scatter wins, a maximum coin jackpot of 3,000, a maximum cash jackpot of $3,000, and it even has an Autoplay function to help make your game play much easier and more fun! The quality of the graphics and sounds provided by the Microgaming software is absolutely brilliant. They possess a record of creating the most spectacular graphics and realistic sound effects. Numerous online slot players love Microgaming because its online slot games have smooth animation and remarkable yet non-intrusive background music and sound effects. Since it is essentially a no-frills type of slot game, Diamond Deal has been designed to have a simple classic slot game with matching land-based casino slot machine sound effects. The casing of the reels includes the reels, buttons and the payout table. The overall graphic design of Diamond Deal displays colors such as blue, green, purple, red, yellow, black and white. Because it is a fairly simple slot machine game, Diamond Deal has constant background sound effects that will make you think you are playing at a real land-based casino with many other different slot machine games beside you. When you spin the reels and get winning combinations, short and simple sound effects common in classic arcade games will be heard. There are no regular card deck symbols available in the Diamond Deal online video slot game. The regular symbols that you will find in the Diamond Deal slot game are the 3-Bar, 2-Bar, 1-Bar, Seven and Cherry. The Wild Symbol is the Diamond symbol. The Diamond wild symbol acts as a substitute for other symbols in order to help you form winning combinations. You are paid varying prize amounts (refer to the Payout table) when you manage to form a winning combination with multiple Diamond wild symbols on an enabled pay line. The Scatter Symbol is the Jewelry Box. It only appears on the 3rd reel. If you manage to get a Jewelry Box symbol to appear on a pay line (with 3 coins max bet), you will be rewarded a Diamond Segment. Collect 4 Diamond Segments to activate the Diamond Deal Bonus Feature game. You will not lose the Diamond Segments you’ve collected even if you exit the Diamond Deal online slot game. The Jewelry Box scatter symbols will not give out any winnings; however, they enable you to play the Diamond Deal Bonus Feature game. To be qualified for the Diamond Deal Bonus Feature game, you have to wager the max bet of 3 coins per spin. If you bet 3 coins and you get a Jewelry Box scatter symbol on the pay line, you are rewarded a Diamond Segment. If you bet 1 or 2 coins only and you get the Jewelry Box symbol on the pay line, you are not rewarded a Diamond segment. The Diamond Segment is included to the Bonus Diamond. When you have collected 4 Diamond Segments, the Diamond Deal Bonus Feature game will be activated. You will not lose the Diamond Segments you’ve collected even when you exit the Diamond Deal online slot game. To play the Diamond Deal Bonus Feature game, you simply choose 1 of the Jewelry Boxes presented to you. The Jewelry Box opens and awards you your prize. You can win up to 600 credits in this bonus game. (Please note that the amount of the bonus prize shown is in credits, not coins). When the Diamond Deal Bonus Feature game is over, you are taken back to the main Diamond Deal online slot game, and your wins from the bonus game will be included to your win total. Diamond Deal has 3 reels where you may bet on 1 pay line only. The betting amount is fixed at 1.00. You can wager from 1 up to 3 coins per pay line bet. Thus, the minimum amount you can bet is 1.00 and the maximum amount you can bet is 3.00 per spin. Please take note that the amounts mentioned above are in Pounds, but they will remain the same if you choose to play in US dollars, Euros, or Canadian dollars. Also, all symbols pay from left to right (reels 1 to 3) in consecutive order, except for the Jewelry Box scatter symbol which pays any. Also, if you want to be qualified to play the Diamond Deal Bonus Feature game, you have to wager a max of 3 coins per spin. The maximum payout in the regular Diamond Deal online slot game is 3,000 coins. Online video slots are much easier and more fun to play when it has an Autoplay function. In Microgaming online slot games, they have 2 game modes – Regular mode and Expert mode. If you would like to play Diamond Deal online video slot game automatically, all you need to do is access the Autoplay function by clicking on the “Expert” button located at the left corner of the game screen. In it, you will find the Autoplay setting that lets you play a desired number of consecutive spins automatically.